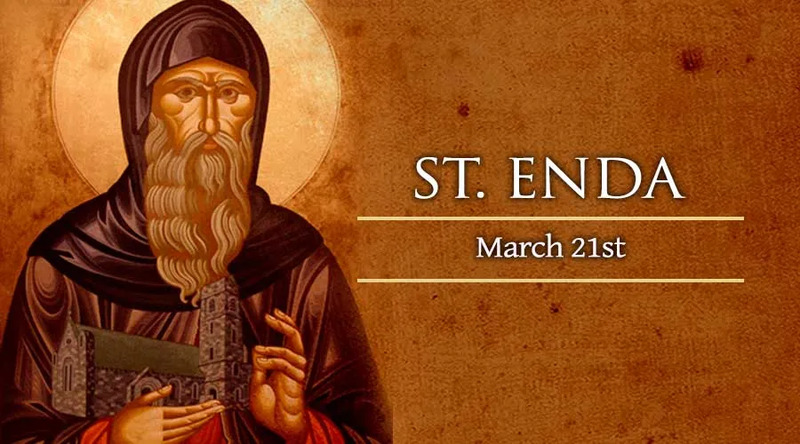 On March 21, four days after the feast day of Ireland's patron Saint Patrick, the Catholic Church honors Saint Enda of Aran, a warrior-turned-monk considered to be one of the founders of Irish monasticism. Born during the fifth century, Enda inherited control of a large territory in present-day Northern Ireland from his father Conall. His sister Fanchea, however, had already embraced consecrated religious life with a community in Meath, and looked unfavorably on the battles and conquests of her brother. Enda is said to have made a deal with his sister, promising to change his ways if he could marry one of the young women of her convent. But this was a ruse on Fanchea's part, as the promised girl soon died. Fanchea forced him to view the girl's corpse, to teach him that he, too, would face death and judgment. In this way, Fanchea – whom the Church also remembers as a saint – succeeded in turning her brother not only from violence, but even from marriage. He left Ireland for several years, during which time he became a monk and was ordained as a priest. Upon his return to Ireland, he petitioned his King Aengus of Munster – who was married to another of Enda's sisters – to grant him land for a monastic settlement on the Aran Islands, a beautiful but austere location near Galway Bay off Ireland's west coast. During its early years, Enda's island mission had around 150 monks. As the community grew, he divided up the territory between his disciples, who founded their own monasteries to accommodate the large number of vocations. Enda did not found a religious order in the modern sense, but he did hold a position of authority and leadership over the monastic settlements of Aran – which became known as “Aran of the Saints,” renowned for the monks' strict rule of life and passionate love for God. While living on an Irish island, Enda's monks imitated the asceticism and simplicity of the earliest Egytian desert hermits. The monks of Aran lived alone in their stone cells, slept on the ground, ate together in silence, and survived by farming and fishing. St. Enda's monastic rule, like those of St. Basil in the Greek East and St. Benedict in the Latin West, set aside many hours for prayer and the study of scripture. St. Enda himself died in old age around the year 530. An early chronicler of his life declared that it would “never be known until the day of judgment, the number of saints whose bodies lie in the soil of Aran,” on account of the onetime-warrior's response to God's surprising call.